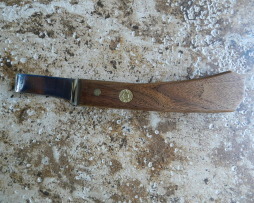 Dan Salcito’s hoof knife is made of Arizona black walnut. It is high carbon steel, heat treated and tempered by hand. This is a must see to appreciate its beauty and effectiveness. It is approximately 8 1/2″ x 1 1/4″. Ergonomically correct.